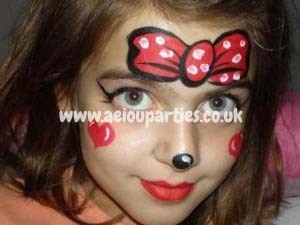 AEIOU Face painters for hire in London guarantee your kids’ party entertainment. In fact, our face painters are just awesome, just like all the other AEIOU children’s entertainers. Your kids’ parties will be even better with our kids’ face painting in London. We have kids face paint, face painting games, clown face painting, and face painters in London able to make your kids’ party a huge success. You can enjoy our face painters for hire in London just contacting us to your children’s party: birthday party, school party, nursery party, Christmas party, corporate and community events, and more. AEIOU Kids Club offers its services to various areas of London, including Central London, City of Westminster, Kensington and Chelsea, Hammersmith and Fulham, Wandsworth, Lambeth, Southwark, Tower Hamlets, Hackney, Islington, Camden, Brent, Ealing, Hounslow, and more. 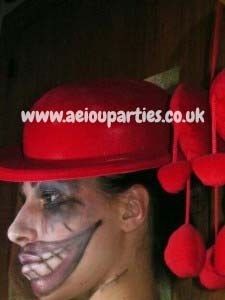 Our face painters for hire in London are the best in the area and they will make your party the best! Our face painters for hire in London will bring that special touch to your children’s party, and I know you little ones will be crazy with our face painters. They love to see their faces painted with beautiful paintings. Now you can have fantastic kids face paint in all your children’s parties counting with the presence of our face painters in London. Take a look! Butterfly – What girl does not like beautiful butterflies? We can draw bright and colourful butterflies on their faces and I assure you they will be delighted with this kids’ face paint. Clown – Clowns always make a great success among the kids. So we decided to bring to your parties clowns’ face painting for kids. Do you have any doubts that it will be great? Animals –UAUF! UAUF! Lots of dogs are coming to your party together with many other animals! Your little ones will have lots of fun with our London face painter for hire! This is one of our favourite kids’ face painting in London and kids will be delighted with it. Pirates – All kids love pirates and we prepared a pirate party especially for them. Take a look at our fun activities and, of course, our face painting. Halloween – The Halloween is a long-awaited party by children and they love to go out asking for treats or tricks. To make it even more especial, you have our Liverpool face painter for hire to give your little one a scary face painting. Hello Kitty – We don’t forget any kid, that’s why we have this kids’ face painting in London for you. Lots of Hello Kitties are waiting for your little girls. SuperHeroes– The Spiderman and Batman are the favourite characters of the boys and we can make your little ones seem like this characters with our face painting for hire. When you hire our party packages, you are also getting our face painters for hire in London. 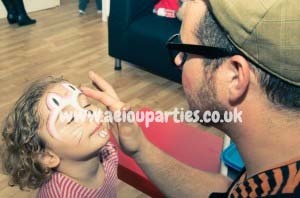 Birthday Parties – You can have face paint in London to make your birthday parties unforgettable. Our face painters for hire in London will do everything to make your birthday party perfect. To make it even better, you can hire our children’s entertainment together with AEIOU kids’ entertainers. School Parties – If you are looking for face painting hire for your school parties we have the best options for you. 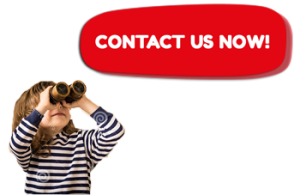 When you hire our party packages, you are getting the best kids’ party entertainment existent in London. So contact us now and book your party today! Christenings, baptisms and weddings – We always dream about our wedding day, and the expectations are also high when we are talking about Christenings and baptisms parties. An excellent option to keep your little ones entertained is getting our face painters for hire in London. Corporate Parties – AEIOU Kids Club will provide everything you need to set up all your corporate parties. Our face painters for hire in Liverpool are just great and they will do everything to make your party memorable. Grand Openings – Your Big Day is coming and we can help you planning it. We have children’s professional entertainers to entertain your little ones with lots of fun activities and face painting for kids. Christmas Parties – Our face painters for hire in London will bring that special touch to your Christmas Party and you can make it even better getting our Santa Claus for hire and our great Elves. I’m sure you won’t regret hiring them. Halloween Parties – Our face painters together with all others entertainers will guarantee your party’s entertainment. Lots of scary face paintings and tricks and treat activities are waiting for you! Themed Parties – Our face painters for hire in London are going to make your themed party unforgettable. Lots of characters are waiting for you and we are going to bring to your party lots of games, activities and party’s essentials you need. Community Parties – If you are going to give a community party, you need to get our face painters for hire in London. We can provide all your party’s entertainment and I know it will be awesome! Contact us. 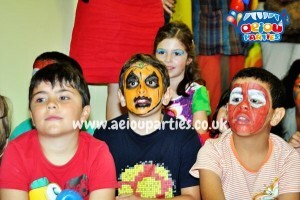 AEIOU Kids Club offers you everything you need to make a great kids’ party, including face painters for hire in London. We can provide your children’s party entertainment in London, Manchester, Liverpool and Birmingham, and I am sure you won’t find better professionals than ours. If you are going to give a children’s party, we certainly need to take a look at our party packages. They were carefully planned to guarantee your kids have lots of fun. So, get our children’s party entertainment and we will send to your party our face painters for hire in London! The success is guaranteed!